Among other things, today marks the long-awaited U.S. release of Natalia Kills' full-length debut, Perfectionist, which has been out in Europe for much of the year already. That there is a U.S. release in the first place is to the credit of the UK-based would-be provocateur and her valiant efforts over the past months to make it happen, from opening for Robyn on her second 2010 US tour to teaming up with Billboard Hot 100 #1 hitmakers LMFAO and labelmates Far*East Movement as a featured artist and, most recently, to performing on a few stops of Katy Perry's California Dreams Tour. The US edition of Perfectionist includes all of the singer's previously released singles ("Zombie," "Mirrors," and official US launch singles "Wonderland" and "Free") with one unfortunate exception, the April 2010 promotional single "Activate My Heart." Released between the so-so "Zombie" and the much better "Mirrors" (although the latter was already available unofficially), "Activate My Heart" was the single that elevated Natalia Kills from give-or-take to artist-to-watch status in my book. Anyone can come up with one good, even great pop/dance single, which "Mirrors" certainly was, but the brooding, thoughtful (if a bit lyrically over-earnest) dirge "Activate My Heart" was enough of a left turn that was handled competently enough to suggest that here might be an artist with talent and some sort of idea or message she wanted to broadcast. Even if that idea still isn't entirely clear - is she making a futile attempt to emulate Lady Gaga? or Robyn? or Jessie J? or is it something else? or anything at all? 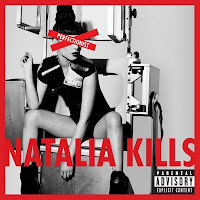 - I was more than convinced once I'd been won over by "Activate My Heart" and the subsequent "Wonderland" that succeed or fail or whatever the result, it would prove interesting seeing how the Natalia Kills project plays out. In honor of the hard-won release of Perfectionist on Yankee shores and in light of its disappointing omission from the album's final track list, "Activate My Heart" is today's Song for the Day. Those in the US can now buy Natalia Kills' debut album Perfectionist on iTunes or Amazon today.